Demolition projects in Los Angeles County come in all sizes from small to large, and each building and location are different. Tri Span Inc. gives the same level of attention to all demolition jobs, no matter what size and is ready and able to provide customized services when required. This attention to detail is what makes Tri Span’s projects safer and what gets their demolition projects completed on schedule and cost-effectively. Los Angeles County has many older buildings with attractive, rare, and beautiful architectural features which are often worth preserving during a demolition for a remodel or a rebuild. Doors, ornamental trim, paneling, one-of-a-kind custom cabinets, mantel pieces, and other examples of craftsmanship of the past can be salvaged during demolition for reuse at the site or sale to a building materials salvaging business. If your building demolition project includes potentially valuable old building materials, Tri Span has the experience and personnel to safely remove and recycle these items during the demolition process, helping you preserve and protect architectural treasures salvaged from your old building. The State of California and the federal government have strict regulations regarding removal and disposal of certain materials often present in buildings. These materials include asbestos, lead-based paint, and soil contaminated with hazardous chemicals. Demolishing all or part of a building safely involves an understanding of, and compliance with, these regulations, as well as knowing the proper facilities for disposal of hazardous materials. 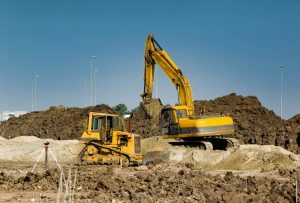 Safety during demolition also involves the use of protective equipment by workers and state-of-the-art tools and technologies for controlling problems with dust, odors, and noise during demolition. Tri Span has the equipment and trained workers for keeping demolition projects safe and in compliance with regulations. Tri Span Inc. has been involved in hazard abatement and demolition of buildings for over 27 years. From removal of heavy steel and concrete structures on large public works projects to delicate and selective removal of sheetrock on interior walls in private residences, this is a company with extensive demolition experience. Operators are available to answer your questions 24/7.